Nice job. The things I'm noticing about this image are minor. First thing I noticed was you can see the bend/corner of your background in the top right corner. 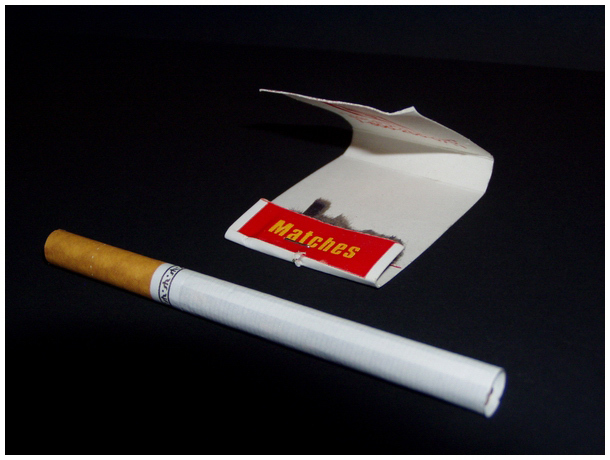 The second thing I noticed was the shadow of the matchbook. Perhaps adjusting the lighting to another angle would prevent that. And the last thing I noticed was that the (right) end of the cigarette is blurred. Still pretty new to photography, so take my comments as you wish. :-) Hope they help though. Nah! Smokers are more resourceful than that. Nice composition and execution. I don't smoke but I understand the frustration in this. Good choice. nice setup. I would have like to see the front tip of the cigarette a little more in focus though. I agree, it's a sign. nice composition. Good lighting, I like the detail. Nice and simple, very effective, therefore - 8.
must be. good luck, i'm trying too. Proudly hosted by Sargasso Networks. Current Server Time: 04/24/2019 09:51:42 AM EDT.